From the time of the Roman Empire, olive oil has been a staple of Italian cooking. From Venice in the north to Sicily in the south, its wonderful flavour has been used to enhance the food of each region to take it to new culinary heights. In recent times, extra virgin olive oil in particular has garnered considerable press for its health benefits and it has now become the norm to see bottles of it in British and American kitchens. 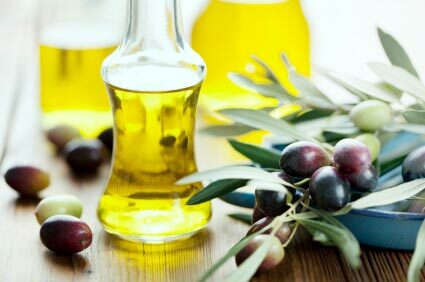 Olive oil is, put simply, oil that has come from the fruit of olive trees. There are many different types of olive oils, and what distinguishes them is the way that the oil that has been processed (rather than what kind of olive has been used). Extra virgin olive oil can be characterised by the fact that it’s unrefined and cold pressed. This basically means that no chemicals or warm temperatures were used in the processing of the oil, which is what lends extra virgin olive oil its high quality and delicious flavours. What can you look for when buying Extra Virgin Olive Oil? There is such a huge range of olive oils on the market, that it can sometimes be a little overwhelming when confronted with fifty different brands to choose the right one! Extra virgin olive oil does tend to be a little darker than normal olive oil. It typically has a golden-green colour, and goes cloudy when put in the fridge. One thing to consider when buying extra virgin oil is to choose your bottle carefully. This is because extra virgin olive oil can go off if exposed to direct sunlight or heat when stored. It’s always best to get oil that is bottled to protect it from sunlight, ideally a bottle that is a dark colour. Extra virgin olive oil is wonderful to taste, but it can go off if not consumed promptly. So when you’re buying, it’s always a good idea to look at the back of the bottle and see when it was harvested (or its use by date). Always try and buy oils that have been harvested within the last two years. But the most reliable way of ensuring you get your perfect extra virgin olive oil is to taste it before you buy. It should taste nutty, with a slightly peppery or spicy aftertaste. Perfect for your Tuscany ribollita or Sicilian arancini.